When I was younger, and actually up until about 6 months ago, I HATED bacon. Crazy huh?! Little did I know how much FLAVOR I was missing out on! Fact about my hubby (and most men in general): My husband is an intense meat lover. A couple weeks ago, we went to a restaurant called Tucanos for a wedding luncheon for one of his cousins. This restaurant is a dream come true for my husband. All you can eat meat, and not just any meat… perfectly cooked, delicious, moist and flavorful meat. I kid you not when I say that we were the LAST ones to leave the table because my hubby would not flip over the block that signals the waiter you are done eating. I just sat there patiently waiting, knowing that my husband would go home one very happy man. One of the meats they served was bacon wrapped turkey. It was outstanding! I went home and tried to search out a recipe similar to this when I came across this one from Kayotic Kitchen. I adapted it to what I had on hand and to jazz it up just a bit, and let me tell you, it turned out DELICIOUS. The smell of the marinade cooking made my house smell SO good! I was literally drooling to take a bite of one of them! (not joking). When my hubby got home and saw what I had cooked up, he beamed from ear to ear. I don’t think I have seen him grin that big over food… ever. These are the perfect party appetizer, game day food, or simply a great recipe to make period. They are SO good! Slice chicken breasts into 20 thin slices, about 1 inch thick. Wrap a strip of bacon around each chicken strip and place in a greased 9x13 pan. Arrange all the "chicks in a blanket" so that they fit nicely. In a small bowl, combine honey, dijon mustard, salt and red pepper flakes. Stir until evenly mixed. Brush half of Honey Mustard Glaze over the tops of all the "Chicks in a blanket". Bake at 350 for about 12 minutes or until bacon is nice and crispy on the tops. Take out of oven and flip them all over to the other sides. Brush remaining Honey Mustard Glaze over the tops and bake for an additional 12 minutes or until bacon is nice and crispy on that side too. Be sure and keep an eye on them. I'm glad you converted to the bacon lover's side because it's awesome! And I've actually made these before and we LOVED them. The glaze is outstanding, and come on--bacon wrapped chicken? Does it get any better?? Um, I will take a bacon "blanket" any day! These sounds super delicious...can't wait to try them. OMG. These look fantastic! I love the photograph, they need to get in my belly asap! So happy I found your blog over at TT&J! Off to find you on FB now! Thanks so much for sharing this goodness! These look so delicious and easy to make! Would love for you to come visit my Get Social Sunday link party that's live and link up your homepage. You can promote your awesome blog! Ok, these look more than delicious! 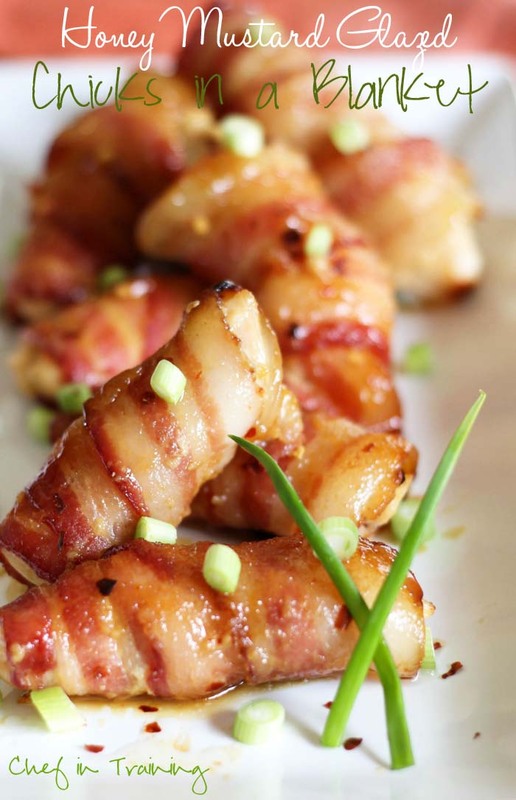 Bacon is my favorite food group so I'll make these soon. Is the chicken raw or cooked when you wrap it in the bacon? the chicken in raw when you wrap it. What if I used duck breasts instead? Would I increase/decrease the cooking time? These look delicious! I can't wait to try them! Okay, I made these for our annual family Christmas party and they were a TOTAL HIT!!!! I think I got two...they were yummy. So I will be making them again (already had tons of requests) for our New Years Eve party. My only problem was that they took super long to cook. Not sure why, but I will make them ahead this next time. Thanks for the recipe. It is really good. 1.) Marinate the chicken in the honey mustard mixture overnight before cooking. 2.) Throw the bacon in the microwave for a minute and a half, or until it just starts to get crispy on the edges, before wrapping it around the raw chicken. The chicken still had tons of flavor, and since I wasn't putting extra marinade on top of the bacon it got nice and crispy when cooked in the 25 minutes mentioned in the recipe. Thanks for the great recipe, Nikki! Made these last night because we happened to have all the ingredients...now it's a hubby favorite in my house too! Is there a way to make this and get a similar flavor without mustard? I'm allergic. By the way I love your blog! do you think these could be frozen for a make ahead meal? I love it, can't wait to make them for "Girls Night Out". P.S. Instruction #4 should read, "half" not "have".